Hello, and welcome to the Week 6 Actual Opportunity Report. If you’re unfamiliar with Actual Opportunity and how it applies to fantasy football, you can read the in-depth explanation here. Essentially, we’re using a 10-season sample of play-by-play data to calculate expected fantasy points from a player’s seasonal or weekly usage. We look at each target (by distance from the end zone and depth of target) and each carry (by distance from the end zone and down and distance) and add this up to determine how valuable a player’s role was for fantasy purposes. We can contrast this with fantasy production to measure efficiency. After a monster Week 5, Brown catapulted to the top of our list, after ranking ninth among all players a week ago. Including intercepted passes, Brown saw a whopping 22 targets last week (including four end-zone targets), worth 44.2 expected fantasy points (most for any player in any week over the past two seasons), but scored only 25.7 fantasy points in a brutal matchup against the Jacksonville Jaguars. Brown currently leads all players in targets (61) and air yards (926) by 141. Despite Ben Roethlisberger’s slow start to the year, and the fact that the Steelers play on the road next week (where Roethlisberger typically underperforms), Brown seems like a safe bet for another big game. Last season the Chiefs allowed the second-most fantasy points per game to wide receivers running routes from their quarterback’s left, and are allowing the third-most this year. This is where Brown typically runs 53 percent of his routes, and could spend even more time there this week, avoiding Marcus Peters’ side of the field. Last season, in two games, Brown totaled 10 receptions for 172 yards and two touchdowns on 16 targets against the Chiefs. Peterson’s fantasy value gets a significant boost in Arizona, after he averaged just 7.25 touches per game with New Orleans. For perspective, the newly released Chris Johnson averaged 12.5 touches per game with Arizona. Still, I’m far more excited about what this means for the fantasy potential of Mark Ingram and Alvin Kamara. If we evenly distribute Peterson’s expected fantasy points between Ingram and Kamara, they jump from 19th and 24th at their position, to 15th and 17th, respectively. I think we also have reason to suspect these numbers climb even further as the season goes on. As a team, the Saints rank seventh in total running back fantasy points per game, but have ranked in the top-two in each of the past six seasons. Both Ingram and Kamara are strong plays in DFS this week, with each ranking outside of the 35 most-expensive running backs on DraftKings. As you’ll see at the end of this article, even before factoring in Peterson’s departure, Ingram was our No. 2 running back value play on DraftKings this week. Arizona leads the league in pass percentage by a pretty wide margin, throwing the ball on 71 percent of their plays. This has led to incredible volume for a number of different receivers. Larry Fitzgerald ranks eighth among wide receivers in expected fantasy points per game, while John Brown ranks 18th. Jaron Brown and J.J. Nelson will split WR3 duties so long as John Brown is healthy. Andre Ellington ranks seventh among all players in expected fantasy points per game over the past three weeks. While the Peterson acquisition likely means a further commitment to the running game, it wouldn’t make much sense to go run-heavy this week against a Buccaneers defense that ranks fourth-best in yards per carry allowed, but ninth-worst in opposing passer rating. Ideally, this is a dream matchup for all of the aforementioned Arizona pass-catchers. Tampa Bay is giving up the most fantasy points per game to opposing slot wide receivers (Fitzgerald), the second-most fantasy points per game to opposing outside wide receivers (Brown), and the fifth-most receiving fantasy points per game to opposing running backs (Ellington). Hyde currently ranks top-15 among running backs in yards per carry and yards after contact per attempt, but PFF grades tell a different story, ranking him dead-last of 54 qualifying running backs. He’s also disappointed in terms of fantasy efficiency, averaging 4.0 fantasy points per game below his expectation, which again ranks last in the league. Still, given the fact that he ranks sixth among all players in expected fantasy points per game, he would have been an ideal regression candidate this week, had head coach Kyle Shanahan not come out and essentially announced a demotion for Hyde. Hyde should not be dropped in leagues, but will be, at best, a shaky flex play until he regains Shanahan’s trust. Jackson ranks 23rd among wide receivers in targets per game, third in air yards per game, first in deep targets per game, and fifth in end-zone targets per game. He ranks 19th among wide receivers in expected fantasy points per game, but hasn’t been very efficient, ranking just 34th in actual fantasy points per game. For three consecutive weeks Mike Evans has drawn one of the tougher cornerback matchups in the league, while Evans has drawn a much softer matchup. Week 6 is no different, with Evans basically guaranteed to be shadowed by Patrick Peterson, while Jackson draws a slow-footed Justin Bethel (4.58-second 40-yard-dash) for the majority of the game. Bethel has surrendered 77 fantasy points into his coverage thus far, which ranks fourth-most among all cornerbacks, and would rank seventh-most among all wide receivers. Though Jackson has mostly underperformed given immense volume and favorable matchups to start the year, I’m going back to the well again this week. Jackson is also one of my favorite buy-low targets in redraft leagues. Jackson hasn’t seen volume like this since his 2013 Pro Bowl season, and throughout his career he’s always been (with various coaches and quarterbacks) one of the league’s most-efficient wide receivers in terms of fantasy points scored over expectation. I’m betting he turns things around to post some big numbers in the second half of the season, once rapport improves with Jameis Winston. I’m definitely way too late to the party, but I’m finally pushing Hogan ahead of Cooks in my weekly rankings. Hogan ranks 10th among wide receivers in expected fantasy points per game, while Cooks ranks just 37th. Hogan has seen six more targets than Cooks, but the difference stems from Hogan’s usage near the end zone. Hogan has seen two targets inside the 5, five targets inside the 10, and nine targets inside the 20-yard line, ranking top-five among all receivers in each category. Cooks, meanwhile, has seen zero targets inside the 20-yard line. Cooks does have one end-zone target to his name, but Hogan has seen six thus far, which ranks fourth-most among all receivers. In fairness to Cooks, he has drawn the tougher cornerbacks in most games, being shadowed by Marshon Lattimore in Week 2 and James Bradberry in Week 4. Unfortunately for him, there’s little reason to expect that changes this week against the Jets. Morris Claiborne has shadowed in each of his last four games (Amari Cooper, DeVante Parker, Marqise Lee, and Ricardo Louis), and ranks 13th-best (of 80 qualifying cornerbacks) in fantasy points allowed per route in coverage. On the opposite side of the field, Buster Skrine ranks seventh-worst in fantasy points allowed per target. Ertz currently ranks first among tight ends in expected fantasy points and 17th among all receivers. Jeffery ranks directly behind him in 18th place. Together they combine to account for 49 percent of Carson Wentz’s targets and 58 percent of his total air yards. Ertz came through in a tough matchup last week, putting together a 6-61-1 line on 12 targets, while Jeffery totaled just 31 yards on four targets in his fifth consecutive brutal cornerback matchup. Jeffery has a somewhat tough matchup this week, likely drawing shadow coverage from James Bradberry, who has shadowed in each of the past two weeks, holding Brandin Cooks and Marvin Jones to a combined 57 yards on nine targets. His schedule improves greatly after this, however, drawing a Redskins defense sans Josh Norman, San Francisco, Dallas, and Chicago in four of his next five games. I do think Ertz’s hot start to the year has partly been a byproduct of Jeffery’s tough cornerback schedule, but I also still think Ertz is near-lock to finish the season among the top-three tight ends in fantasy scoring. Engram currently ranks sixth among tight ends in expected fantasy points, while also ranking fifth at the position in targets, and first in routes run. The Giants just lost wide receivers Odell Beckham Jr., Dwayne Harris, and Brandon Marshall to season-ending injuries, while Sterling Shepard is also questionable for Sunday’s game against Denver with an ankle injury. Ultimately the Giants will be without at least three of their four top wide receivers. The Broncos are allowing the sixth-most fantasy points per game to opposing tight ends, and Engram seems poised for a big game as the (literally) only healthy receiving option on this team. One surprise for me was seeing Funchess rank 23rd among wide receivers in expected fantasy points per game, while Benjamin ranked just 55th. Even if we remove Week 3, when Benjamin played on just seven snaps, he still ranks far below Funchess at 35th. Though Funchess certainly got a boost from Benjamin’s absence in Week 3, he’s trumped Benjamin in expected fantasy points in each of the past two weeks as well. Perhaps related to the fact that Funchess played as a tight end for the majority of his college career, Greg Olsen’s injury has been a great boon to Funchess’ fantasy production. Though, still, I’d bet Benjamin has the bigger fantasy outing this week. Benjamin draws the superior matchup, while Funchess continues to miss practice with a knee injury. The Eagles are allowing the most fantasy points per game to wide receivers lined up to the left (19.9), which is where Benjamin runs the far majority (53 percent) of his routes. Allen was another surprise for me, ranking 13th among running backs in expected fantasy points per game. Indicating a lack of efficiency, he ranks just 19th in actual fantasy points per game. With Terrance West likely to miss time, Allen could be in for another big game against the Bears this week. So far, Allen is averaging 18.7 carries per game and 4.0 targets per game in victories, and 5.0 carries per game and 6.0 targets per game in losses. Vegas suspects the Ravens win this game fairly easily, as 6.5-point home favorites. While he’s certainly not been the most efficient running back on his team, the volume is there at an attractive enough salary to keep him in play in DFS this week. Some negative regression candidates include: Chris Thompson, Will Fuller, Michael Crabtree, Nelson Agholor, Duke Johnson. 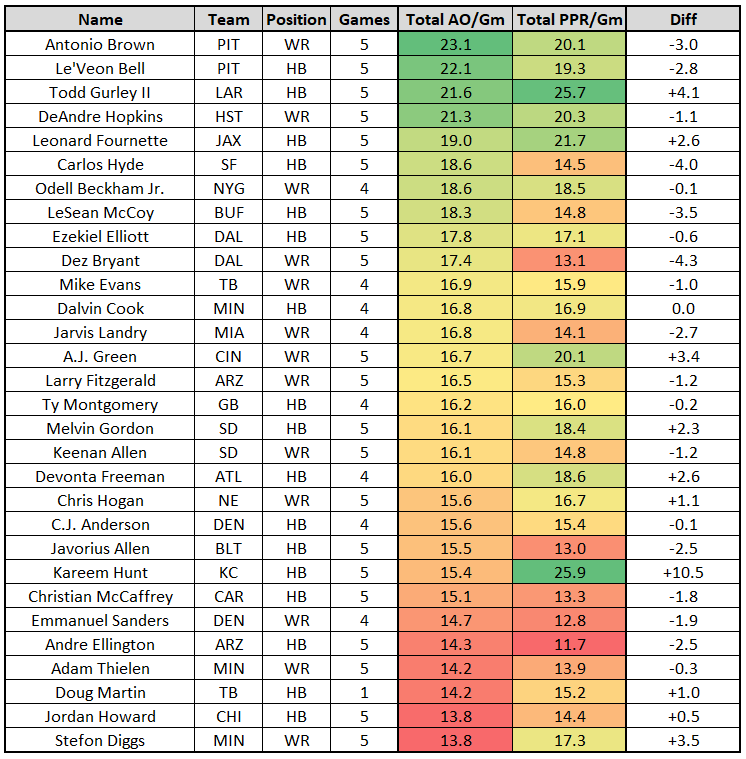 Some positive regression candidates include: Zay Jones, Amari Cooper, John Brown, Dez Bryant, Carlos Hyde, Jay Ajayi, LeSean McCoy, Jimmy Graham, Eric Decker, Martavis Bryant.